Straight-Line Winds Mean Roof Damage - JA Edwards of America, Inc. Residents of the Orlando area typically keep a close eye on the weather during hurricane season. Any signs of activity out in the Atlantic Ocean could mean tropical trouble heading that way. But hurricanes aren’t the only warm weather phenomenon that the people of Orlando should worry about. A strong thunderstorm can produce straight-line winds that can seriously damage a roof quite quickly. Also known as downbursts, convective wind gusts, or outflow, straight-line winds originate from thunderstorm activity. 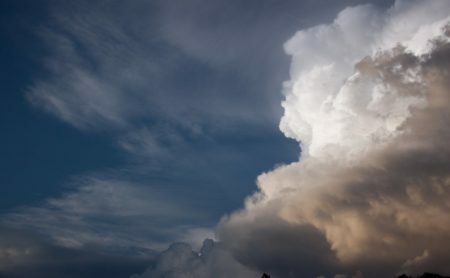 Warm air (typical during summer in Orlando) leads to updrafts. These strong updrafts can then lead to strong downdrafts. If the thunderstorm is moving quickly, these winds will push out ahead of the storm. Winds more than 58 miles per hour are classified as severe. Obviously, it is these winds that can do the most damage to a roof. Although they originate in similar ways to tornadoes, straight-line winds differ in one key aspect. Whereas the winds in a tornado spin in a vortex, leading to scattered debris, straight-line are just that: straight. The damage they do will follow a straight line. Thunderstorms that produce straight-line winds are the same storms that can produce two other roof-damaging effects: hail and heavy rain. The combination of all three can all but destroy an entire roof. If a straight-line storm blows through your Orlando neighborhood, you should know the damage that might occur. Areas around the edge of a structure are most at risk. The straight-line winds can lift the exposed edge, cracking or otherwise compromising the shingles. Particularly strong winds will start with the edge shingles, then “peel” the rest back as well. Then the heavy rains pour across the newly exposed surfaces. After the straight-line wind event, inspect your home for damage. Look for damaged or missing shingles. Inspect the ground around your home as well. Your property might be the landing spot for a neighbor’s missing shingles. You might also find evidence of other debris that might have further damaged your roof, like limbs and branches. If you spot any damage or just want an expert to check out your roof, contact us here at J. A. Edwards America. We’ll send out a trained professional to assess the damage to your roof and start you on the road to roof repair.